Occasional stomach or abdominal cramping occurs throughout pregnancy. Many pregnant women experience cramps in the first trimester, sometimes before they know they are pregnant or soon after they discover they are pregnant. Abdominal cramps are also common in the second trimester due to growth of the uterus. Women experiencing severe cramps during any stage of pregnancy should call their doctor. Occasional abdominal cramps are a normal part of pregnancy. Cramping occurs in response to the changes that a woman’s body experiences during pregnancy. Mild cramps during pregnancy feel like menstrual cramps and do not indicate complications, injury to the mother or distress to the fetus. Severe cramps or cramps accompanied by vaginal bleeding necessitate a call to the doctor. After conception, the fertilized egg travels up the fallopian tube to the uterus. 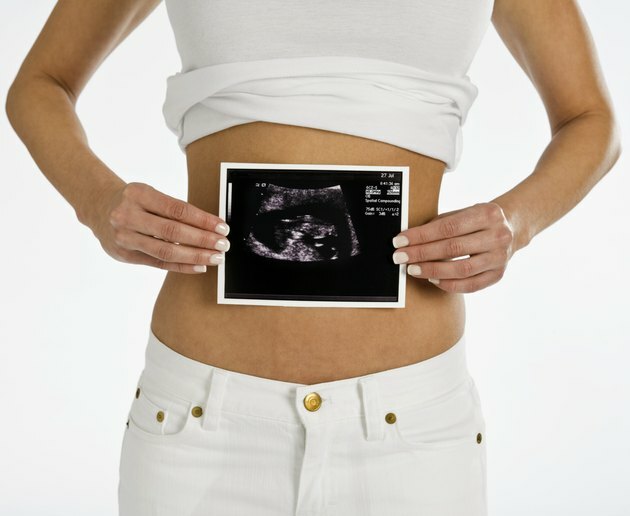 During implantation, the fertilized egg attaches to the wall of the uterus and the placenta forms. Some women experience mild cramping during implantation, which occurs during the fourth week of pregnancy, about 10 to 14 days after conception. The fourth week is also the time when a woman would expect to start her menstrual cycle, if she wasn’t pregnant. Many women do not yet know they are pregnant when they experience abdominal cramps associated with implantation. Some women do not experience this type of cramping at all. Sharp, painful cramps in the lower abdominal may indicate a problem that requires medical attention. An ectopic pregnancy occurs when a fertilized egg implants in the fallopian tube or other location outside the uterus. If undetected, an ectopic pregnancy causes persistent cramps around six to eight weeks that intensify and spread throughout the abdominal or pelvic area. An untreated ectopic pregnancy ruptures by 12 to 16 weeks and causes severe cramping vaginal bleeding, dizziness, nausea and vomiting. Ruptured ectopic pregnancies are life-threatening without medical treatment. Similar severe abdominal cramps and bleeding may also indicate and impending miscarriage. Women that do not experience cramps in the first trimester will first experience them later in pregnancy. During the second trimester, weeks 14 to 28, the ligaments and muscles of the abdomen stretch to accommodate the expanding uterus. The stretching results in brief cramps on the sides of the abdomen or lower in the pelvic area. These cramps are sometimes called round ligament pain. A woman with abdominal scars from previous surgeries may experience more discomfort from these cramps as her belly grows and stretches.